This entry was posted on Wednesday, January 11th, 2017 at 10:05 pm. 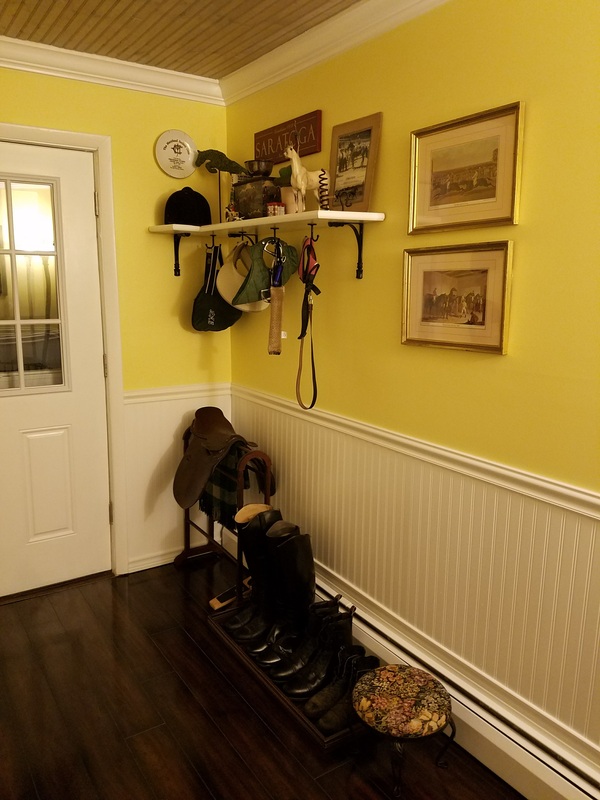 I have shared some pictures of my equestrian-themed mudroom on Instagram, but I don’t believe I’ve ever blogged about it. I recently gave it a tremendous cleaning (lots of muddy paw prints abounded! ), and restyled my shelf. I love how it came out! 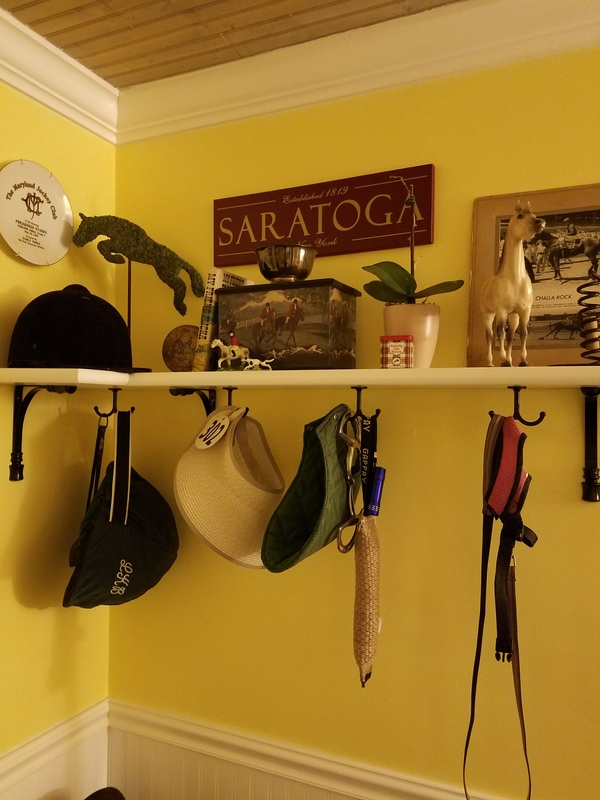 I guess I shouldn’t say it’s “equestrian-themed” as the room just became what I needed it to be – a room for a horse person to store her horse things. This room is very small, but we did quite a bit to it. The door you see was once a window. We didn’t have an exit on that side of the house, so replacing the window with a door allowed us access directly into the dogs’ yard. 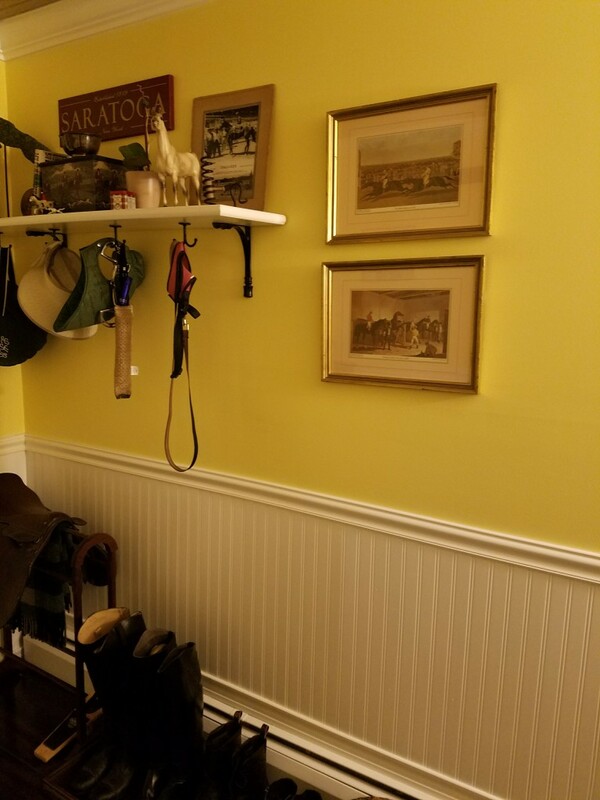 The closet that you see (with the custom barn door my handy husband built!) actually extended farther into the room, creating an ‘L’ shape. It took up a lot of unnecessary space in an already small room, so we had that part removed. We paid a contractor to do those two jobs. James did everything else. We stained wainscoting a sand color and nailed it to the ceiling. 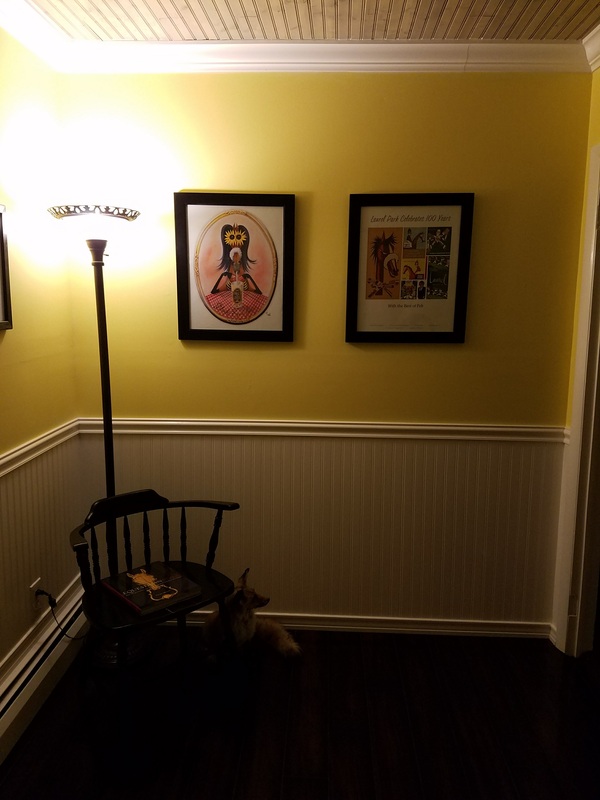 Then we used the same wainscoting on the walls, painted white. The yellow in the room is not as vibrant or dark as these pictures make it look. 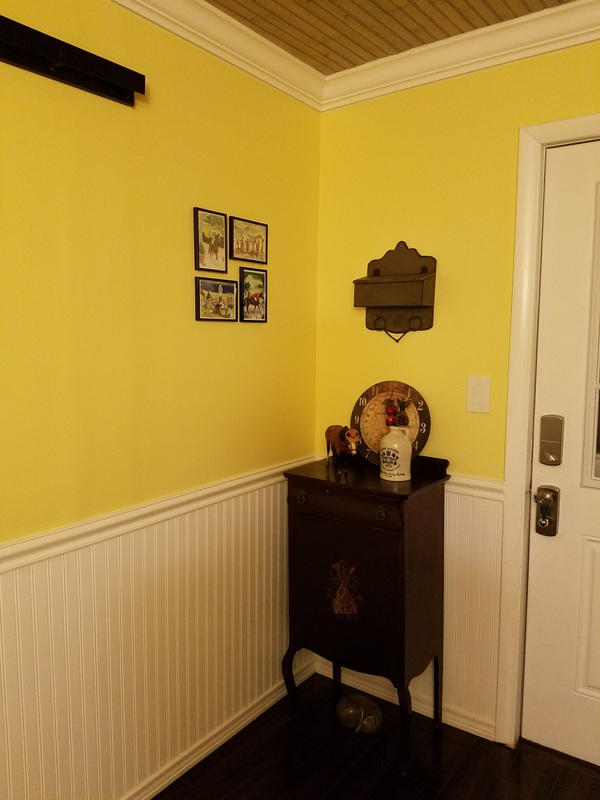 It’s a bright yellow, don’t get me wrong, but the white wainscoting tones it down quite a bit. James also built the white shelf in the corner using stair treads! The photo below shows the door to the outside, as well as the cutest antique cabinet I found at a local shop. Just about everything displayed was found at a yard sale, was a gift, or was upcycled from my childhood (the ‘Old Timer’ Breyer!). This is the custom door my husband built. 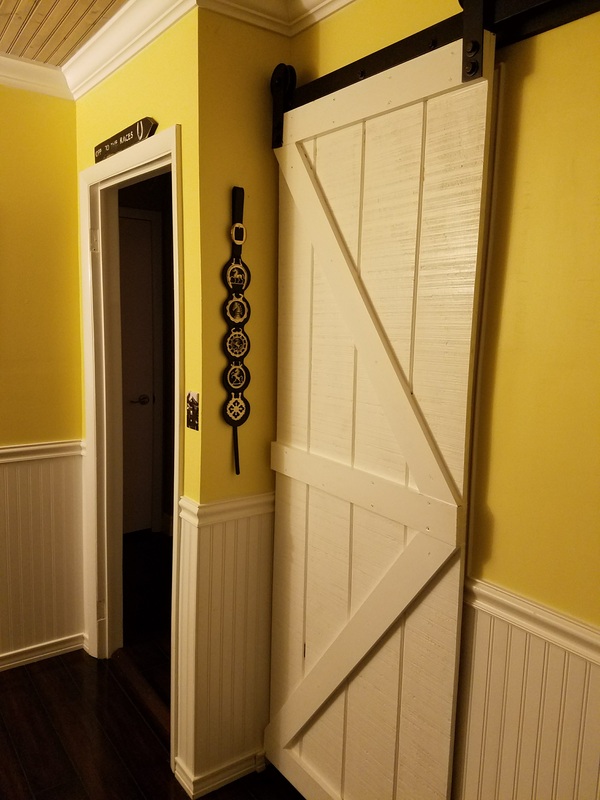 I knew I wanted a sliding barn door there, but after I priced out materials (for the door and slider itself), it was well over $1,000!! I did want to use reclaimed barn wood though, which is expensive, but we didn’t have that kind of money for this project. So James found a YouTube video and did it himself! The total cost was about $130 – I’ll take it! That lamp is the only light in the room, so sorry about the photo quality. Those pictures on the back wall were posters I’d picked up for free somewhere. The one on the opposite wall is the Sports Illustrated cover with American Pharoah! And yes, I have a stuffed taxidermy fox; I named her Ruby. (If you haven’t figured out yet that I’m a little crazy, you know now)! 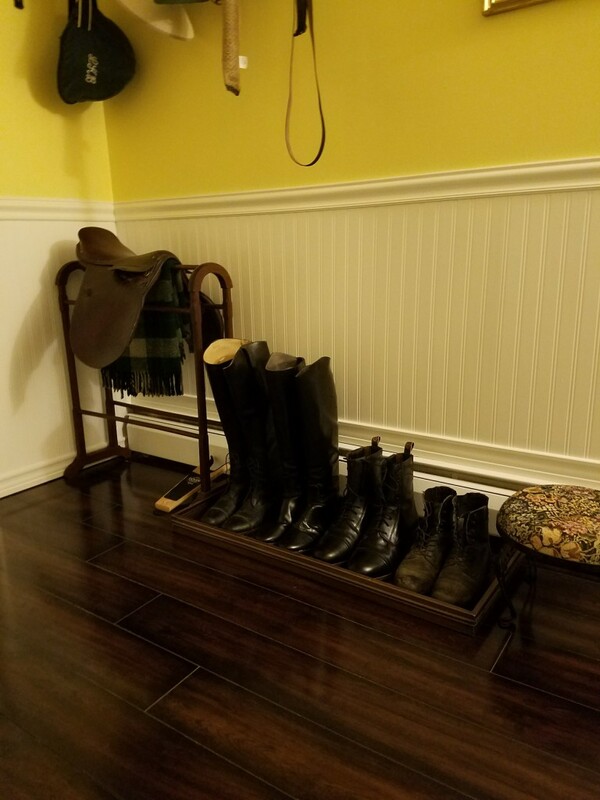 Finally, as you continue to rotate around, you’ll see a boot tray with a bunch of my boots (and James’), an old exercise saddle that belonged to a friend, and the shelf James made. 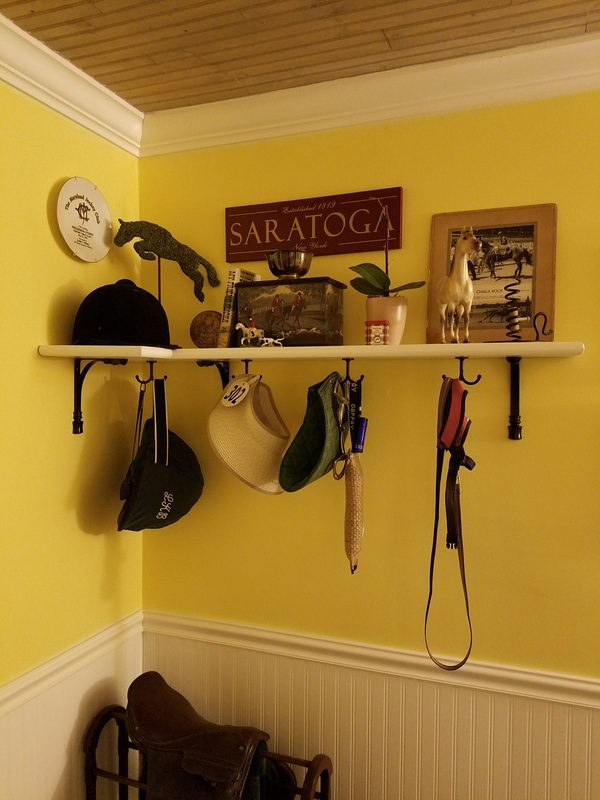 On it hangs hats, the dog leashes, and Julep’s coat. 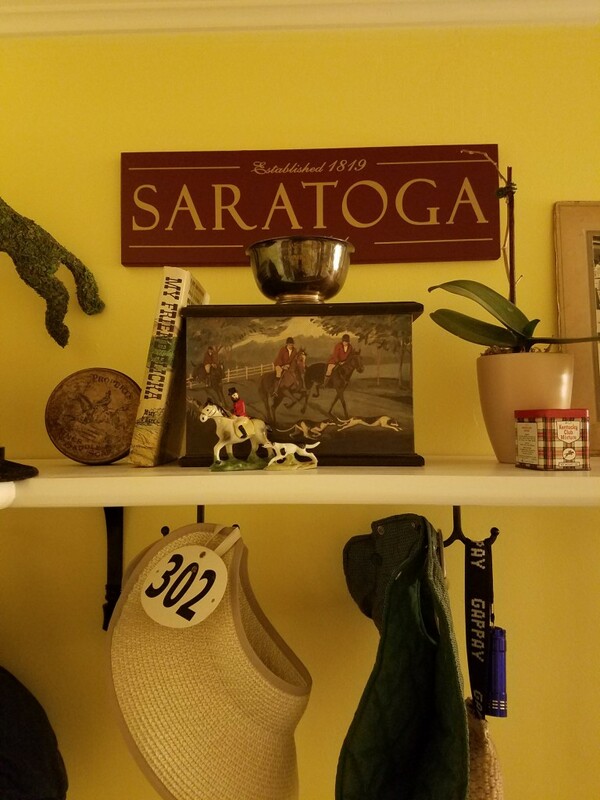 On top is a variety of items – most yard sale finds or things from my childhood like my very first helmet and another Breyer. The two pictures to the right were also procured at a yard sale for $2 a piece! As you can see, I enjoy decorating with items that, for the most part, I already have. It’s amazing what you can find by shopping in your house! A quick trip to the attic, a closet, or tack room is all you need! For everything else, yard sales, vintage sales, and antique shops will do the trick. 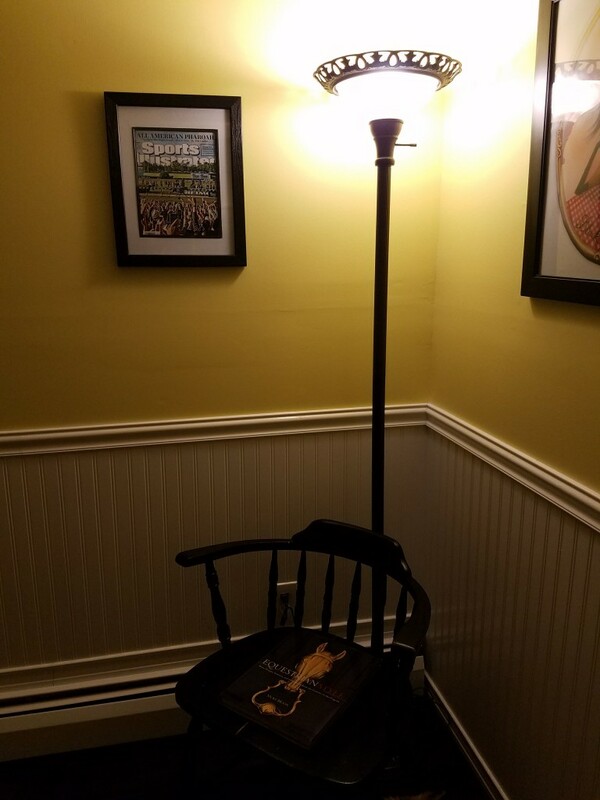 When you’re fixing up an old house, there’s not much $$ leftover for decorating, so I have to get creative!